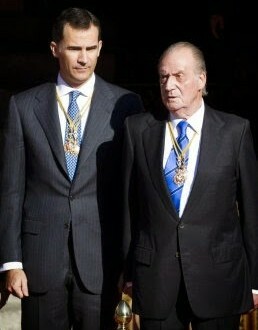 SPAIN: King Carlos Abdicates For Son - Joe.My.God. After a nearly 40-year reign, Spain’s King Juan Carlos has surrendered his throne to his son. Juan Carlos, whose health is failing and has had a number of hip operations in recent years, is stepping down for personal reasons, Mariano Rajoy said on Monday. “His majesty, King Juan Carlos, has just communicated to me his will to give up the throne,” Rajoy said. “I found the king convinced that this is the best moment to change the head of state in all normality and for the transition of the crown to the Prince of Asturias (Prince Felipe),” he said. Prince Felipe, a former Olympic yachtsman, has been relatively unscathed by the scandals that battered others in the family. Once popular Juan Carlos, 76, who helped smooth Spain’s transition to democracy in the 1970s after the Francisco Franco dictatorship, has lost public support in recent years due to corruption scandals and gaffes. After the abdication news broke last night, tens of thousands poured into the streets of cities across Spain to demand a referendum on abolishing the monarchy.